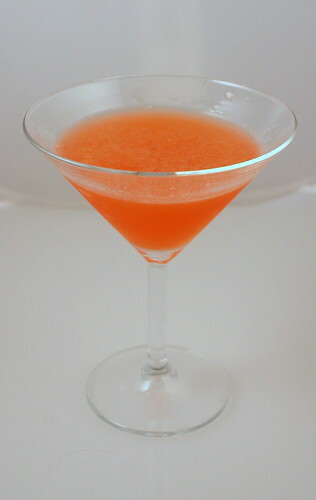 What other cocktails do you think could benefit from a dash or two of the rhubarb bitters? That's actually a really good question, and one that I run into with most bottles of bitters that I pick up. I think the rhubarb would go well with any fruity cocktail or classic sour, or something that would need some astringency. This bitters (and the Fee's grapefruit bitters) both have a citric-acid bite, but with that depth and oomph that only bitters can provide. one of my favorite tricks--and pardon me if you already know this one-- is for delicate flavors like strawberries, infusing in the refrigerator. it brings out all the delicate perfume-y elements and allows for a really bright infusion. it's sort of like the opposite of making tea... instead of heating, or even leaving at room temperature to produce a fast bold flavor, cooling it down allows it to take its time. anyway, this sounds like a really nice drink and i'll totally give it a try come strawberry season! That's a neat trick; I hadn't heard of it. Thanks! Similar to the case of cynar, I imagine that rhubarb bitters would go great with chartreause. Say, for example, a cynar-and-something flip with a few drops of rhubarb bitters stirred in. just a thought. Personally, I'll be making Chartreuse pavlovas with rhubarb bitters mixed in with the strawberries (Chartreuse only in the meringue).